Many people were surprised when Anthony Forsyth came second in a stunning 100 mile debut of 16 hours and 4 minutes at last months North Downs Way 100. I was not one of them. He was not even mentioned in the pre-race build up as a potential winner, but blew the old course record out of the water by over an hour and a half. I got to know Anthony in the build up to the race and it was clear that whilst he wasn’t going to brag about planning on winning the race publically, he did plan on doing just that logging huge training miles and building his confidence. Was he out of his league, or was he going to nail it? He did the latter. This too was my first 100 mile race and, if you have read my race report below, you will know it ended slightly differently to Anthony’s. Since that day, I have been taking it easy running wise as my next race is not until November and I have a plan in place for 2014. One thing I have been very poor on since leaving home at 18 is nutrition. Both in my general diet as well as during races. I devour vegan athlete’s books such as by Scott Jurek and Rich Roll, but find myself with a dominos in front of me at least once a week. Great intentions and a knowledge of healthy food from my upbringing and University course, but a lack of discipline for junk. I have always justified this by the amount of running I do, but how much could I improve if I altered my diet. Don’t get me wrong, I eat very well most of the time- especially main meals where my wife is super healthy and an excellent cook, but I do sneak in a lot of crap. Crisps, snickers, take aways all add up. So after Anthony’s stunning second place and my not so stunning drop, I started looking at not just his miles but his food and diet- especially on race day. For my race, I did what everyone says not to do and gambled on certain foods because I thought they would go down well on the day- this included rice pudding and mars bars. Hardly any got touched. I suffered terrible nausea and without calories I couldn’t finish the race. 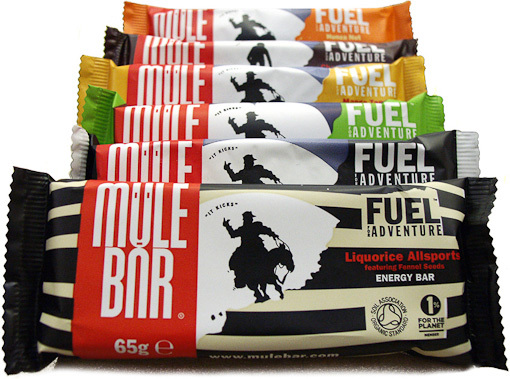 Anthony on the other hand had taken out sponsorship with Mule Bar, who I hadn’t heard of before. It turns out they do energy bars, protein bars and gels. They were started by two climbers who felt nauseous in the Andes and knew there was surely a better way to eat during altitude or intense exercise…or both. Mule have kindly sent me a trial box to review and I have now used most of their products. To be clear, I haven’t run anything further than a marathon since the race, so all I can do is review the products based on up to four hours of running. However, as you will see from the below they will now be a staple part of my running diet and as I build up to longer runs again, I will use all three of the products sent to me. Firstly, to look at the gels. These are what most long distance runners rely on for condensed energy in an easily digested manner. To date I have used Gu gels mainly, probably because they sponsor a lot of the races and I want to train with a product I will get for free on the day. To keep it simple, just by looking at the back of both packs it is clear that Gu is created in a lab and Mule in a kitchen. Mule use just five ingredients in each and most importantly all the ingredients are ‘real’ food. Their ingredients are natural and include fibre, which is all too often stripped out of our western diet (for more on this read ‘Fat Chance: The Bitter Truth About Sugar’ by Robert Lustig). In addition to fibre, the Mule gels include protein and are sweetened with brown rice sugars, as opposed to Gu’s with no protein and Maltodextrin Glucose. With Mule, it is clear that simple is the formula they are after but utilising the environment they created the business in, with Himalayan crystal salt to help with electrolyte replacement. The gels are easy to consume and not as thick and dense as Gu’s. Whilst I find Gu’s get sickly after a while, due to their consistency they are somewhat filling and if I had one criticism of Mule gels it is not that they should be thickened, but that perhaps a larger serving is also offered so you can decide which is most appropriate for you depending on what stage of a race you are at and how you are feeling. At 197 calories, the bars are perfect to supplement the gels every hour or two during an ultra distance race. They are easily digestible but somewhat heavier than I imagined they would be having eaten the likes of Nakd bars in training. This was not a bad thing, but did involve more chewing than I was expecting which can be slightly annoying when running. At the same time, they are truly filling and delicious- not too sweet or sickly, but the sort of thing you can imagine eating all day (if needs be…). At 3 grams of fat per bar, only 0.4 grams of this is saturated fat- an incredibly low amount for a sports energy bar. Typically half the fats or more would be saturated. Again, this is testament to the natural ingredients. There are three grams of fibre and two grams of protein- all in all, as well put together as the gels but in a firm format for when you need something real to eat. Of all the Mule range, my favourite has to have been the protein bars. I used these twice after long runs and with 20% protein per bar, found I recovered quicker than normal. Usually I feel slightly sick or at least not hungry after a long run. However, these are dense and moist bars that digest slowly and are again not too sweet. I often get tired or sometimes even grumpy after a while when sitting down after a long Sunday run, but I genuinely felt like I bounced back with these and had more energy for the kids or even for a trip to homebase…maybe. I only have one criticism of my experience with Mule and that is the packaging. If your hands are sweaty or in the winter with gloves (I am guessing), the packaging is hard to tear open. This can be annoying and I am sure some kind of ribbon that wraps around the bar, could be implemented. Aside from this, what I really like about Mule is that it is real food, created for athletes by athletes. Furthermore they are made here in the UK, utilise Fairtrade ingredients and support the Soil Association. They probably even pay corportaion tax too, Starbucks.